Enjoy the warmth and beauty of solid Acacia hardwood outdoor furniture that you can enjoy year round. The SLAT 3 Pc dining Set is designed for small spaces such as balconies, townhouse patios or decks and comes fully assembled. Made with eucalyptus wood with water-resistant properties that makes it suitable for outdoor use in Canada. The 20 inch x 40 inch tabletop hinges flat to a compact 7 inch depth for storage. The two folding chairs also store within the table frame. The SLAT 3Pc Dining Set is a Small Space Solution designed to conquer the tight space constraints that is a reality of modern urban living! 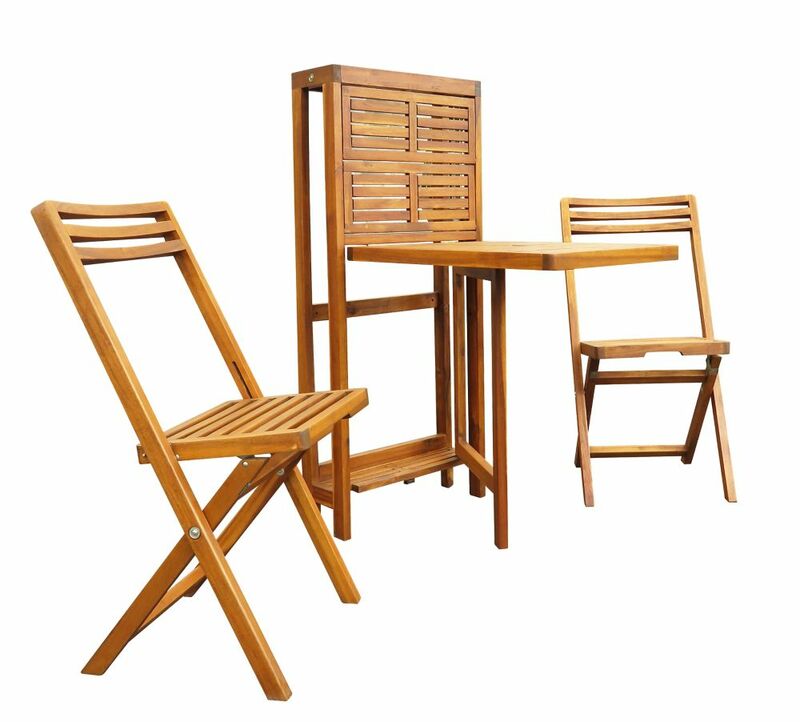 3 Pc Dining Set Enjoy the warmth and beauty of solid Acacia hardwood outdoor furniture that you can enjoy year round. The SLAT 3 Pc dining Set is designed for small spaces such as balconies, townhouse patios or decks and comes fully assembled. Made with eucalyptus wood with water-resistant properties that makes it suitable for outdoor use in Canada. The 20 inch x 40 inch tabletop hinges flat to a compact 7 inch depth for storage. The two folding chairs also store within the table frame. The SLAT 3Pc Dining Set is a Small Space Solution designed to conquer the tight space constraints that is a reality of modern urban living!